Select energy-efficient LED fixtures that will provide a consistent color of light throughout the entire project. Explain how a fluorescent lighting fixture could be more efficient than an LED fixture. Apply industry best practices to avoid potential issues associated with this new and highly-efficient light source. Specify high-quality LED fixtures that will achieve performance and efficiency goals of the design. In the lighting industry today, there is a lot of enthusiasm around light emitting diodes (LEDs) and LED fixtures. Unfortunately, the relative infancy of the light source and the lack of standards in the LED industry, paired with an explosive market, is creating a perfect storm, where specifiers, owners, contractors, and maintenance personnel are learning valuable lessons in LED the hard way. 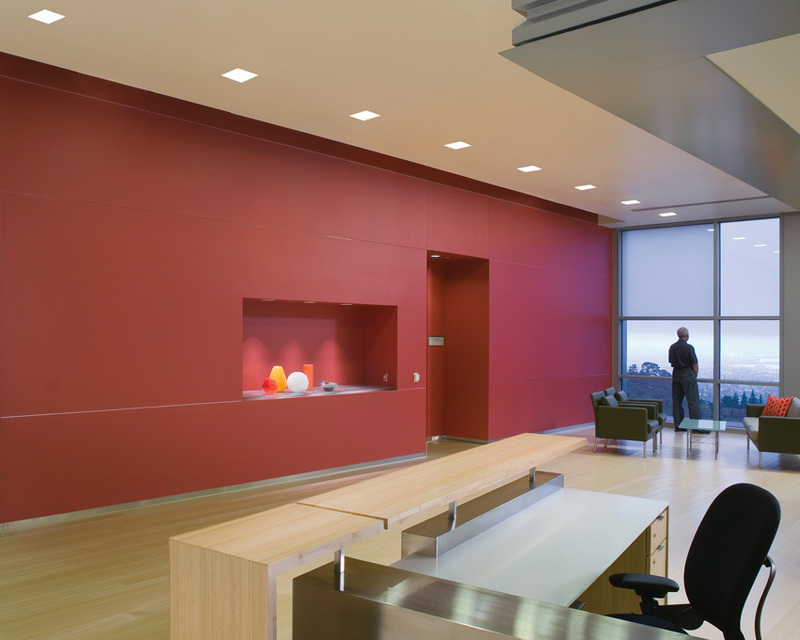 In the Lawrence Berkeley National Laboratory, unobtrusive and energy-efficient LED downlights highlight the reception area wall, while leading a path to the beautiful view outside. Perhaps the most critical misunderstanding in the market is that an LED fixture is not synonymous with a quality fixture. There are high-quality LED fixtures and poor-quality LED fixtures. The truth of the matter is that the quality of a fixture is not defined by the light source at all, but how the fixture and the light source work together to illuminate a space. A good-quality fixture should provide a reliably consistent color of light, provide more light with less energy usage, and distribute the light into the interior space appropriately. Good-quality fixtures are manufactured to be durable, safe, and provided to customers in a way that is easy to install and maintain. The selection of quality, specification-grade luminaires, over fixtures that deliver a subpar and problematic performance, is an important step in achieving the design objectives of any space, regardless of the light source. 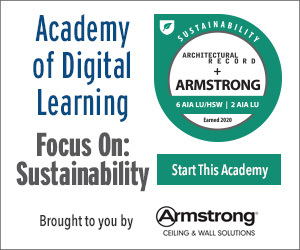 This course will take a closer look at some of the biggest performance issues facing LED fixtures and provide some tips on how designers can ensure that they are selecting quality LED fixtures for their projects. Ensuring that an LED lighting system delivers a consistent color of light throughout a space is a basic tenet of good design for any new or retrofit project. Imagine walking into a typical commercial space and noticing a discrepancy in the color of the white light coming from the seemingly identical overhead fixtures. Some of the fixtures may glow a crisp blue-white, while others bathe the interior in a warmer, slightly yellow-hued light, and others cast an altogether more neutral white light into the space. This inconsistency is distracting, at the very least, and gives the overall lighting system the appearance of being a mish-mash of disparate parts and pieces, rather than a uniform and carefully coordinated whole. While the goal of consistency in lighting is a fairly universal objective, designers may be surprised to learn how easily LED fixtures and fluorescent fixtures that produce different tones of white light can end up on a job site. Quality fixture selection is imperative to prevent an interior space from becoming a showcase for different shades of white. 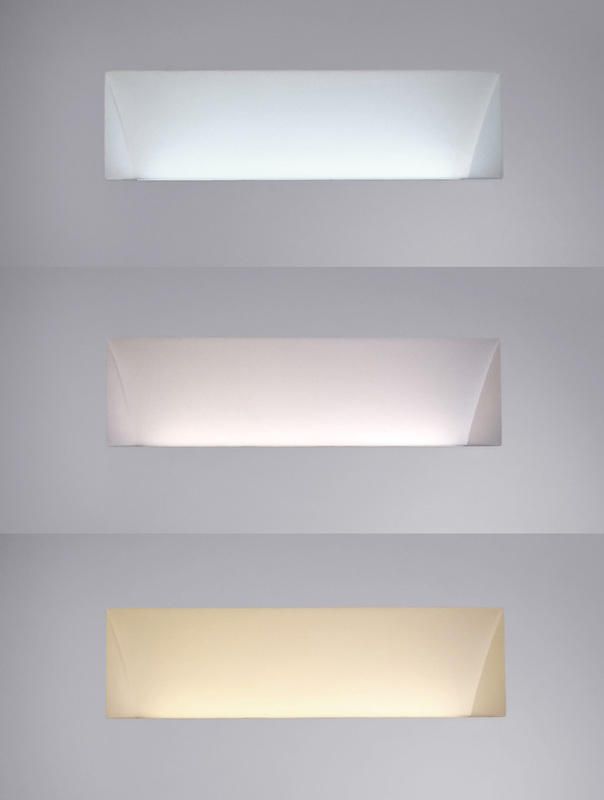 These three wall-recessed, uplight luminaires demonstrate the visible difference between LED sources with different color temperatures—2700K (bottom), 3500K (middle), and 5000K (top). While the color of white light can be subjectively described in terms of the color spectrum, such as being more blue or more yellow, a metric exists that quantifies the color of light emitted by a light source. The correlated color temperature (CCT), measured in Kelvin (K), provides an objective and more accurate way to discuss and compare the tone of white light emitted by a fixture. A light source with a color temperature of 2700K emits a warm, yellowish light that resembles the light emitted by an incandescent bulb. A color temperature of 3500K indicates that the light is neutral or intermediate white light. At 4000K, the emitted light is a cool (bluish) white light. The color temperature of daylight is 5000K. Unfortunately, inherent variation in the lighting industry and the power of human perception requires that designers consider more than the CCT of a lighting fixture when specifying a system to provide consistent color temperature throughout a space or building. As a general rule, the more complex a light source is to develop, the greater the potential for variability in the color of light it produces. For example, the production of incandescent bulbs has become relatively straightforward over the years and, as such, the color consistency of incandescent light sources across the market is excellent. Incandescent lamps are reliably produced within the narrow CCT range of 2700K to 2800K, which is perceived as a nearly standardized light color. The CCT of fluorescent light sources typically fluctuates in the range of plus or minus 50K, which is not really noticeable. However, due to differences in manufacturing processes and product-specific nuances, there is often a perceivable color variation in the fluorescent lamps produced by different manufacturers. Three seemingly identical fluorescent lamps, with the same measured CCT, that are produced by three different manufacturers can produce light that appears noticeably different. When specifying fluorescent lighting fixtures onto a new project, retrofitting, or replacing, it is a best practice to ensure that all of the fluorescent fixtures utilize the same lamp manufacturer. LEDs produce a much more variable color of white light. One reason for the variability within LED sources is that the sources themselves are a combination of many individual LED chips. The color temperature of every individual LED chip must be measured, and then the chips that produce a somewhat similar color of light are combined onto the larger LED arrays to produce a light source that provides a light color that is, ultimately, an amalgam of the light colors produced by all of the individual LED chips. Image courtesy of Nanosys Inc. The MacAdam Ellipse graph illustrates the range of indiscernibility as three standard deviations from the reference color, also commonly referred to as a three-step MacAdam ellipse. When specifying these newer, more variable sources, the question then becomes, “What is the threshold where people are able to see that the lights from two sources are discernably different?” Researcher D.L. MacAdam mapped the ability of people to differentiate between the chromaticity of two light sources and identified ranges in which a human observer was unable to detect a difference in color. 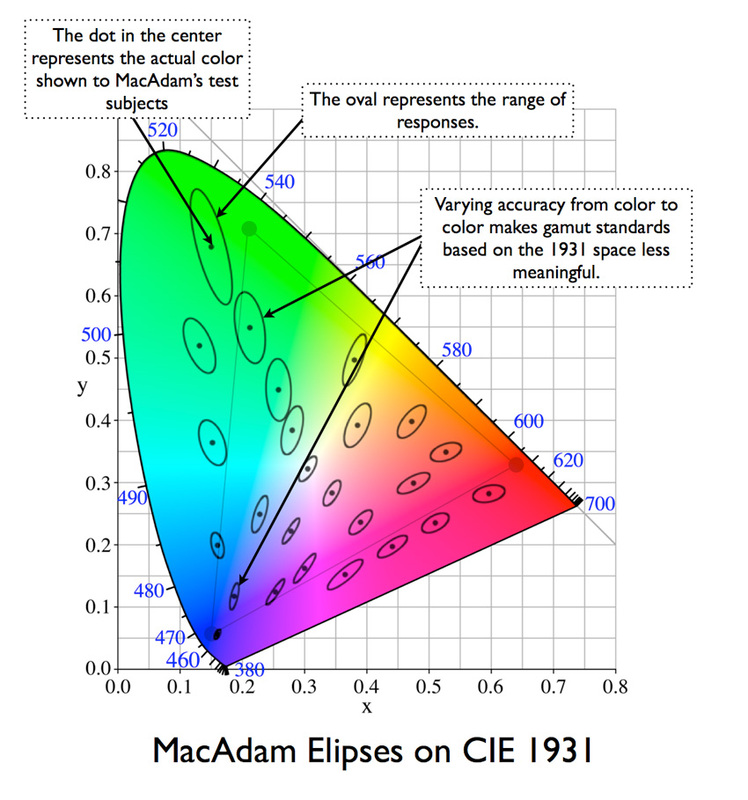 The graphical results of his color-matching experiments formed elliptical patterns that defined the range of indiscernibility as three standard deviations from the reference color, so it has been called the three-step MacAdam ellipse. Another name often used within the industry to describe the MacAdam ellipse is Standard Deviation Color Matching (SDCM) ellipse. Current industry standards for color consistency in LEDs do not require that these sources remain within the three-step MacAdam ellipse. It is common practice to bin white LED chips together that fall within the four- to seven-step ellipse. In fact, the standard written by the Illuminating Engineering Society (IES), called IES LM-79-08: Approved Method of Electrical and Photometric Measurements of Solid State Lighting Products, references the ANSI standard, Specification for the Chromaticity of Solid State Lighting Products, which allows LEDs to be considered as having the same “nominal” CCT if they fall within a seven-step MacAdam ellipse. Unfortunately, selecting LED fixtures that are binned to a seven-step MacAdam ellipse tolerance (or 7xSDCM) may result in there being a noticeable difference in the color of white light produced by the LED fixtures supplied for a job. When specifying LED fixtures, the binning practices of the fixture manufacturers is of paramount importance. Tighter binning practices, where the supplier organizes its LEDs within a three- or four-step MacAdam ellipse, result in LED fixtures that will reliably produce a more consistent color of light. LED technology has been developing and changing at an ever-more-explosive rate as the LED megatrend gains momentum. Changes in manufacturing processes and materials have altered the color and brightness of the LED boards over time, so replacing the LED source in a single fixture that was initially installed years ago, or retrofitting part of a space to match older LEDs in another part of the building, may result in the newer LED source providing a very different color of light when compared with the older LED fixtures. Partnering with an established and reputable lighting manufacturer can help to alleviate some of the growing pains associated with specifying a new and rapidly developing technology.